Pêcher le sébaste et la truite pendant que vous regardez les dauphins et les lamantins jouer à partir du quai de 200 '. Prenez le temps et vous aurez la meilleure vue sur les lancements de navettes et de fusées. Amarrage de bateau gratuit, Internet sans fil, câble, cuisine extérieure. Près du parc, du golf, des plages, des magasins et des restaurants. Universal Studios, Sea World, Disney et Daytona à moins d'une heure. Des dégâts causés par des ouragans ont endommagé le quai, la digue de mer, certains patios extérieurs et leur décor, et nous les réparons actuellement. Maison d'hôtes: ~ Deux chambres, un appartement de bain 4 personnes avec un lit queen size dans chaque chambre. Le tarif pour cela est de 475 $. 00 par semaine et 1300 $. 00 par mois. ~ Une chambre, une chambre d’hôtes pour 4 personnes avec un lit queen-size dans la chambre et un canapé-lit queen-size. Le tarif pour cela est de 425 $. 00 par semaine et 1200 $. 00 par mois. ~ Lorsque le calendrier n'indique aucune disponibilité, les deux unités sont louées. S'il vous plaît envoyer un courriel pour des informations détaillées. We had a great time staying here ! Very cute little place, clean and comfy. Amazing patio overlooking Indian River for just hanging out. We were lucky enough to watch a rocket launch which was icing on the cake . We also saw dolphins swimming by . Highly recommend but be aware you will have to carry your belongings from front to back and up a flight of stairs. Thought I would mention that for anyone who may have knee issues. Overall, would definitely stay again ! We stayed for our honeymoon this month and I cannot express how AMAZING it was! The property was beautiful, the view was gorgeous, and pictures simply don't do it justice. Brandy and Craig were so helpful, and we couldn't have asked for a better vacation. It's in a very quiet location, the town is beautiful, and it was only about an hour to Orlando. We would definitely stay again! Just what our family needed. My husband and I brought our two boys and our goldendoodle for the weekend of the Cape Canaveral Historic Lighthouse half marathon and 10k because I was doing the race. The location to the base was amazing. The house is so charming and cozy! We loved the full kitchen and living areas but spent most of the time fishing on the dock and sitting outside because the weather was awesome. The hosts were wonderful to us and there was an ant issue at one point that they jumped right on and resolved (houses in Florida have aunts-that's a thing that happens. We will be back! This property is a gem. Quiet, spotlessly clean, and a large and well-stocked kitchen. A full two bedrooms with comfortable beds. We woke up to sun rise over the Indian River, looking across the water at the Merritt Island Wildlife Refuge and Kennedy Space Center. We walked the miles of trails on the Wildlife Refuge every day, watching manatees, alligators, and birds. Also central to great restaurants, golf, and shopping. We stayed for just over a week but would have liked much longer. We will definitely be back. A comfortable and quiet flat with great amenities in a perfect location. We stayed in the flat for a week at the beginning of October. It is light and airy and really comfortable. Having never driven in the US before, it was very easy to find. Brandy came to say hi and was so accomodating, she even printed our tickets to the Kennedy Space Centre for us. The beds are comfortable and the kitchen has everything you could possibly need. I took my coffee to the chairs at the end of the dock every morning where you could see the vehicle assembly building at the space centre, as well as an abundance of birds, fish and other wildlife. One morning we even saw dolphins playing next to the dock. The flat is ideally located for the space centre, Merrit Island National Wildlife Refuge where we saw bald eagle and gators amongst other things, and the beaches as well as Disney. We just adored staying here and wish we lived closer so we could visit again soon! 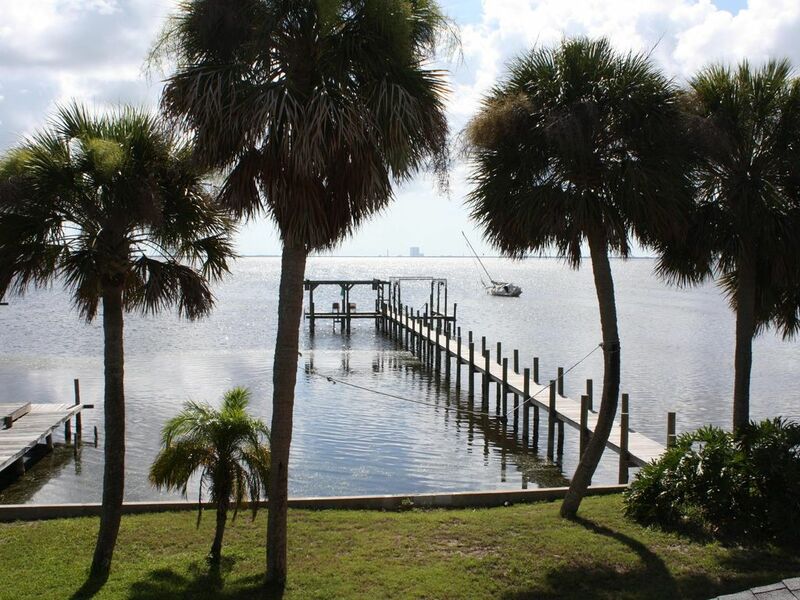 Cute little bungalow-style home on the Indian River with a beautiful view! My husband and I were in Titusville for the weekend for a wedding, and this place was perfect! The house is nice and clean with all the ammenities you would need for a stay. The view of the Indian River is amazing! I would recommend this to anyone looking for a nice little quiet stay in Titusville! $250 deposit is non-refundable if reservations are canceled $45.00 pet fee Accepts credit cards through paypal for the additional 3% fee that paypal charges.